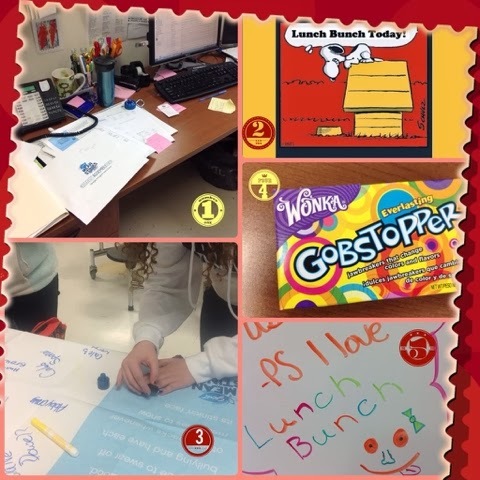 Thanks to Tabitha Panariso and her blog, Scrapbook of a School Counselor, I have decided to try to show you a glimpse into my day. I may be a little slow in posting this, but this is a peek of my world last week. 1. My desk. A tad bit messy, and a million projects going on at once. The biggest last week was the Mean Stinks Assembly. Notice all the post it notes all over my desk. I'd be lost without them. I should take stock in the company, because I might have an addiction. My desk is also home to my computer and iPad; two other things that I'd feel lost without. Last, but not least, my desk is home to my planner. In this job, you need to be organized and know when everything is going on. 2. Lunch Bunch. My week wouldn't be complete without my groups. I really look forward to seeing them every week. We've been talking a lot about "making a difference." We have really big plans this year to do just that. I can't wait! 3. The Mean Stinks Pledge. We passed around the blue nail polish during lunch periods and the whole school went blue! Everyone signed the pledge to end bullying. We are going to treat each person with respect. I had music and videos of last year's Mix It Up Days playing while everyone was signing. i thought it would get everyone in the mood and excited for this year's Mix It Up. 4. Gobstoppers. My indulgence during times of stress. Yes, I know it isn't chocolate, but I can make a Gobstopper last longer. . .plus it brings out my inner child. 5. A Smile. This is part of a message one of my LBers left for me on my whiteboard. Don't you just love it?! So, Thank you Tabitha! What a great idea. I had a lot of fun showing you a little piece of my week.